Well hi there! Okay so... pretty deep post, I know. I always care about how my fellow law students are doing both academically and emotionally, but around October I always become a bleeding heart for y'all, and especially for the 1L's. This is because for me, October was really when I started to feel like I was sinking more than I was swimming, all the stressors of law school finally caught up to me, and TBH it was hard for me. I've heard between 25%-33% of first year law students feel depressed so today I'm sharing what helped me. Obviously to each their own and what works for one person might not work for another, but maybe after hearing how working out helped me mentally you'll be able to find your own thing that has the same benefits. I should forewarn you though that I don't get a runner's high nor ever claim that a workout flew by because I was having so much fun. The reality is that while I'm working out I truly don't enjoy myself and instead count down until it's over. I actually stressed out over still being stressed while I was working out and kept worrying that if I wasn't able to "clear my held" during a run or while doing yoga, that there was no hope for me. Here's how I found out it helped me anyways. When I was feeling depressed my 1L year, I slowly shut out the world and stopped doing anything. Seriously, my life was just school, come home and read for school, and then just nothing. I'd just lay in bed for an entire weekend and not do anything because I had no motivation to participate in life. But once I started working out, I had to add this to my daily to-do's and it started to get me back in to a routine. Instead of just school and then nothing, I had school and working out. It doesn't sound like much, but just having something to take away from how much "nothing" time I had really helped. Instead of thinking okay now that class is over I guess I'll go get in bed and stare at the wall I was thinking okay now that class is over I need to go change for my workout. Just this little thing helped me get back in to my pre-law school, normal routine. The absolute worst night of my 1L year was when I went to bed at 10pm when my bedtime alarm went off, and I just laid there listening to my sleep noise app for the entire hour and a half and realized that I was still awake at 11:30 even though my body felt tired. So I sat there and just thought because my mind was wide awake and the next time I checked the clock it was 2am. This continued as I tried every suggestion that Google had to help me fall asleep until I finally passed out sometime after 6am. I had a 9am class the next morning and it was literally hell. Those 2 hours of sleep were the worst I ever got, but it was very common for me at that time to just never get a good night's rest because I was just so unhappy and unconnected from the world. After I started working out, my body became sore and needed sleep to rest and recover my muscles. This made me exhausted in a different way than how feeling depressed made me exhausted and I finally started to actually fall asleep without hours of effort and would sleep soundly the whole night and actually wake up feeling normal. This started to make such a huge difference in me because I no longer felt like a shell of a person just going through the motions but actually felt like a normal person again. Usually I'm a stress eater so it was totally foreign to me when I suddenly had no appetite at all and was having to force myself to choke down buttered toast just to make the hungry headaches go away. It was actually scary for me because I've never had an eating problem and was afraid that this was going to spiral into something that I couldn't control like the people you see on Dr. Phil. Plus there was the obvious effect of not fueling my body so I just felt drained all the time and was starting to not be able to even focus in class. But oh boy, I did a good hour-long workout and for the first time in weeks I was starving! Before the loss of appetite I had been falling back on junk food and it felt revitalizing to eat some real, nutritious food for once. By the end of my first week of working out I was starting to eat like a normal human again and it felt like I was getting back to myself. You've probably heard plenty of times that lawyers have a high tendency to be alcoholics, and I can totally see why. It's super common to have some drinks after you bomb a cold-call or a test and that's what all 1L's seem to do together, which is fine in moderation. But when it stops being fine is if you start to drink every single day or start to get drunk constantly instead of just having a drink. Working out turned out to be a solution to that. One kinda tipsy workout made me learn to never drink the same day I'm working out and one hungover workout made me learn to limit my drinks the night before I workout. Both times were absolutely terrible and nauseating, but they were good tools to help me remember what are and aren't normal (and healthy) drinking patterns. Now I'm still not a person who has a bad day and wants to go straight to the gym to workout my frustrations, but at least now I'm the person who is like okay I'm stopping because I've already had one drink and I don't want to throw up during tomorrow's workout. I realize how ridiculous this sounds but I'm also grateful that I already learned this lesson and found a solution that worked for me before it ended up ruining my career. One weird thing about feeling depressed is that the repetitive everyday tasks just really upset me. I would either feel so physically and mentally exhausted that I couldn't even entertain the idea of washing the dishes or I would just cry thinking what's the point of washing and putting up dishes if I'm just going to have to get them down and dirty them up again?? And this didn't just apply to dishes— laundry, washing my hair, shaving, picking up around my apartment all just made me feel like what's the point?? But a 3-mile run will make your clothes and body sweaty and my new appetite made me dirty up dishes again, so I had to get back to normal cleaning duties. Like I mentioned above, this helped me get back in to my normal pre-law school routines. It also made me self-conscious about how I was presenting myself and it's amazing how shaving and actually doing your hair can make you feel like your old self again. This is also why now I firmly believe in the saying a cluttered house is a cluttered mind. A nice side-effect of working out frequently is that you start to tone up. Class wasn't so bad when my shorts went from being a little too tight and uncomfortable while I was sitting at my desk to being a little looser and more comfortable. I felt better going to events when I wore a dress that I used to look fine in suddenly made me look damn good. I wasn't necessarily body-conscious before, but having baby abs show up definitely made me feel good about myself! And then this confidence started spilling over into how I felt about myself at school and it helped break me out of this negative mindset that I had been in for way too long. Exercise gives you endorphins, and endorphins make you happy. Happy people just handle law school stress better than truly unhappy people. 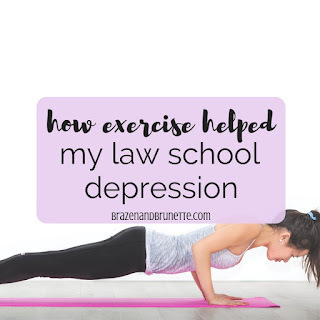 All jokes aside, it really did help me get out of all the ruts I found myself in when I was having severe anxiety and feeling depressed from law school. If you're starting to feel like you're in a law school rut, I encourage you to try out exercising for everyday for a few weeks and see if it helps! Even if it just helps you feel like a 4 instead of a 3 on a given day, that's still an improvement. For all you on the struggle bus rn, hang in there!